CHARLOTTE, N.C., November 25, 2014 — Window World, Inc, America’s largest replacement window and home remodeling company, participated in the St. Jude Give thanks. Walk.™ Saturday, Nov. 22, 2014. This was the fifth year Window World participated in this event supporting St. Jude Children’s Research Hospital®. Window World, Inc., located in North Wilkesboro, N.C., raised a total of $18,495, making it the top fundraising team in the Charlotte, N.C. region, which included over 80 teams. Leading the charge was Chairman and CEO Tammy Whitworth, whose total of $5,250 made her the top individual fundraiser in the entire Charlotte market. In an earlier release, St. Jude shared that since the Give thanks. Walk began, it has raised more than $17 million to help provide cutting-edge treatment and pursue visionary research to find cures and save children battling cancer and other life-threatening diseases. These funds ensure that no family ever receives a bill for treatment, travel, housing or food. Nationwide, Window World® participated in the walk with 28 teams raising over $106,000 through a combination of fundraising and sponsorships in their local areas. Every dollar raised contributes to the fundraising total for Window World Cares®, the charitable foundation of Window World. Next week, Window World will celebrate the fifth annual “Window World Day” at St. Jude in Memphis, Tennessee. The group will host a holiday party handing out gifts and participating in various activities with patients and their families. Window World of Paducah is locally owned and operated in Paducah, KY. Window World is an ENERGY STAR® partner and its window products have earned the Good Housekeeping Seal for ten consecutive years. The store, located at 155 County Park Road in Paducah, KY, serves homeowners in the counties of Ballard, Caldwell, Calloway, Carlisle, Crittenden, Fulton, Graves, Hickman, Hopkins, Livingston, Lyon, Marshall, McCracken, Franklin (IL), Gallatin (IL), Hamilton (IL), Hardin (IL), Jefferson (IL), Johnson (IL), Massac (IL), Pope (IL), Pulaski (IL), Saline (IL) and Williamson (IL). For more information about Window World of Paducah, visit windowworldofpaducah.com or call (270) 443-0031. Window World Cares was founded in 2008 by Tammy Whitworth and her late husband, Todd. The foundation provides funding for St. Jude Children’s Research Hospital®, where it was named New Corporate Partner of the Year in 2010. Since its inception in 2008, the foundation has raised over $5 million for St. Jude. 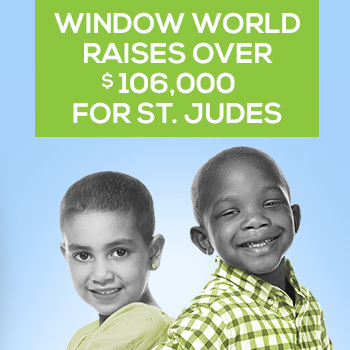 To learn more about Window World Cares or to donate, visit www.WindowWorldCares.com.